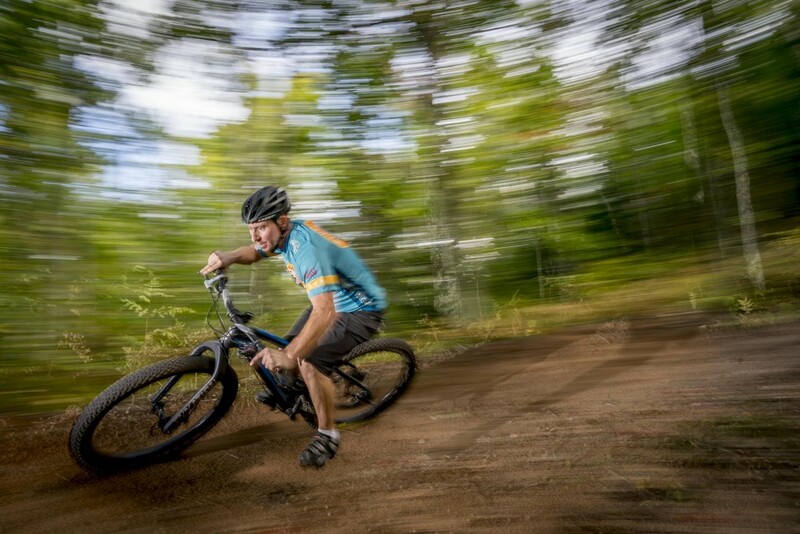 Testing a new Sony camera on the CAMBA and COGGS Mountain Bike Trails. I’ve been searching for a way to replace my Nikon DSLR gear with a smaller, lighter mirrorless camera system for some time now. My Nikon D800 is still an amazing camera, but I often need to carry a camera in a small handlebar bag or in a backpack and the Nikon is a little big for that. If I am going on a longer tour, like the train trip we take every year, a full DSLR kit adds a lot of weight and bulk when I need to keep up with the other riders who are only carrying some clothing. I have been very tempted by the new mirrorless camera systems because their image quality is now on par with a full frame DSLR and they are so much smaller and lighter. I shoot a lot for the Bike Fed, and while I don’t rely on my cameras to make a living as I did when I was a professional photographer, I still put my gear in some pretty demanding situations. That means I need a professional camera system that can do everything my Nikons have been able to do so well for years, but I’d like to lose some weight and bulk (don’t we all). I dipped my toe in the mirrorless water with a Fuji X-T1 camera body and a handful of lenses to fill out that system and I love most everything about the Fuji X. It is small, light, has a great sensor, and has a robust and ever-expanding system of great lenses. 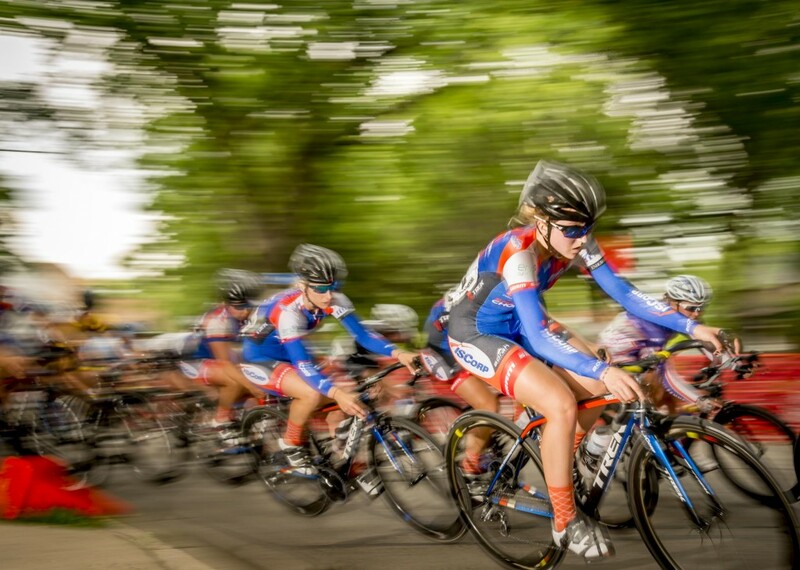 The autofocus is good enough to use to shoot bike racing. Not as good as my Nikons, but good enough. And because I cut my teeth on Nikon F2s and Leica M3s, I really like the lenses with an actual aperture ring and shutter speed dial on the body. I have taken lots of images with my Fuji, including the wrap around cover of our July magazine. But as much as I like the Fuji X system, it has one flaw that forces me to keep my Nikons. I can’t use rear curtain sync and an off-camera flash. That is a deal breaker for me because I use that feature all the time. I use it at criteriums to shoot racers coming out of a dark corner and I use it in the woods to pop a key light on mountain bikers in order to separate them from the background. On paper it looks great, but is it really good enough to let me sell my DSLR system or will I find a hidden flaw like I did with the Fuji X-T1 and have to keep my Nikons? I got a chance to find out thanks to my long-time shooter friend Patrick Murphy Racey. Pat has been a professional photographer since I worked with him at the old Milwaukee Journal in the early 1980s. Since then he has shot for virtually every magazine and wire service out there covering news, sports and features from the Super Bowls to big annual reports. Pat was recently named one of the Sony Artisans of Imagery, so he was able to have Sony ship me an A7rII and some glass in time for me to take it on a work trip up to Duluth/Superior and Bayfield with a stop in Butternut to do a little bow hunting, fishing and get my deer stand ready for rifle season. Based on Pat’s recommendations, the night before we were schedule to leave, I packed my Fyxation Blackhawk carbon fat bike, only took the Sony loaner camera gear and my hunting stuff for the trip Up North. I was nervous as I loaded my gear into Nick Ginster’s truck and my Nikons were back in the house, but I tried to trust in Pat and Sony and think about the fun trip ahead and the great images waiting to be made. 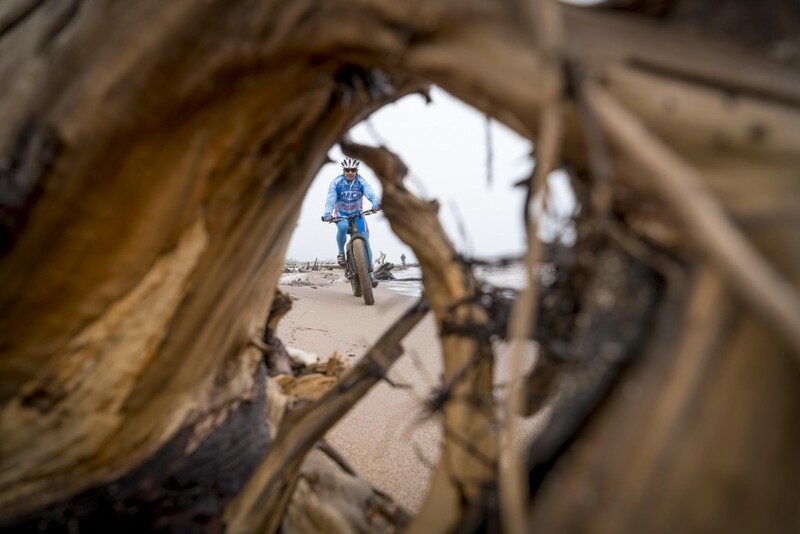 Last year Nick and Fyxation generously donated one of their sweet carbon Blackhawk fat bikes for the Saris Gals live auction item, and included a guided trip to ride with him on the trails and beaches up along our North Coast. The winner of the bike and trip was John Fleckenstein, a long-time member of the Bike Fed and all around great guy to ride with. Rounding out our crew was Julian Kegel, a member of the Bike Fed’s Board of Directors and Wisconsin cycling royalty. Nick, Julian and I have been exploring and riding Wisconsin’s North Coast for the last few years. 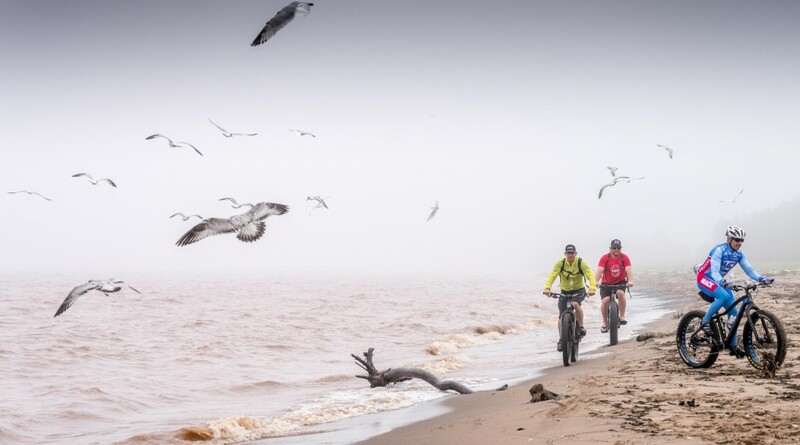 Our adventures have allowed us to pedal across a frozen Lake Superior, find legal sea caves to ride in, cruise the worlds longest inland sand bar and shred some amazing flowing trails built by the dedicated volunteers from the Chequamegon Area Mountain Bike Association (CAMBA) and the Cyclists of the Gitchee Gumee Shores (COGGS). Fleck was stoked to come with us and check out what we billed as some of the best riding in the Midwest. The rest of us were itching to ride the North Coast again too, but we also planned to refill our growlers at Thirsty Pagan Brewing, probably our favorite brew pub anywhere. 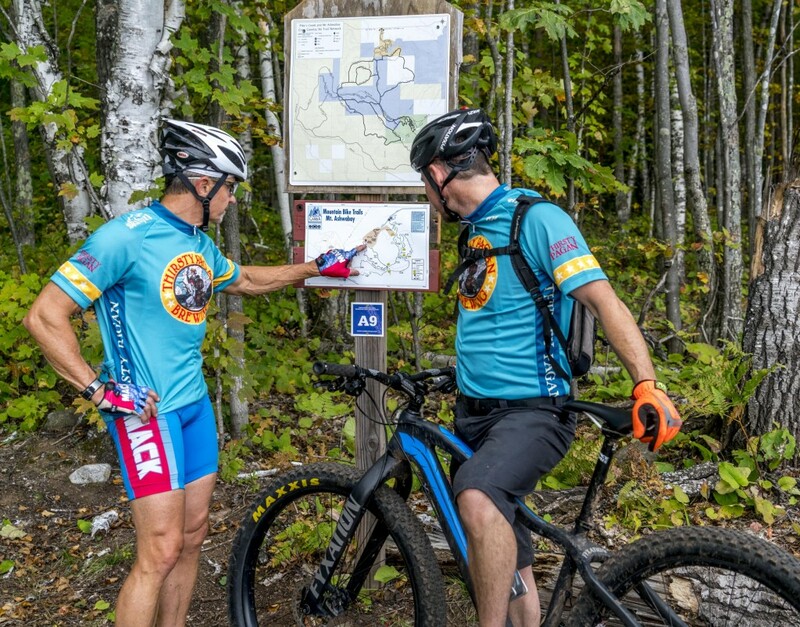 We were scheduled to drive all night so we could get up the Duluth Saturday morning, September 26th, just in time to join our pals from COGGS for their Gitchee Gumee Galivant, an annual 50-mile fun ride on the best trails in the area. We arrived in time, albeit a little sleep deprived, but mother nature had other plans. It had rained heavily the three previous days, so all the trails were closed and the COGGS crew were gonna ride the local gravel roads instead. That sounded fun, but as foggy as it was and as tired as we were, we opted to skip their ride and catch some Zs back at the Barkers Island Inn and then do some beach riding after. 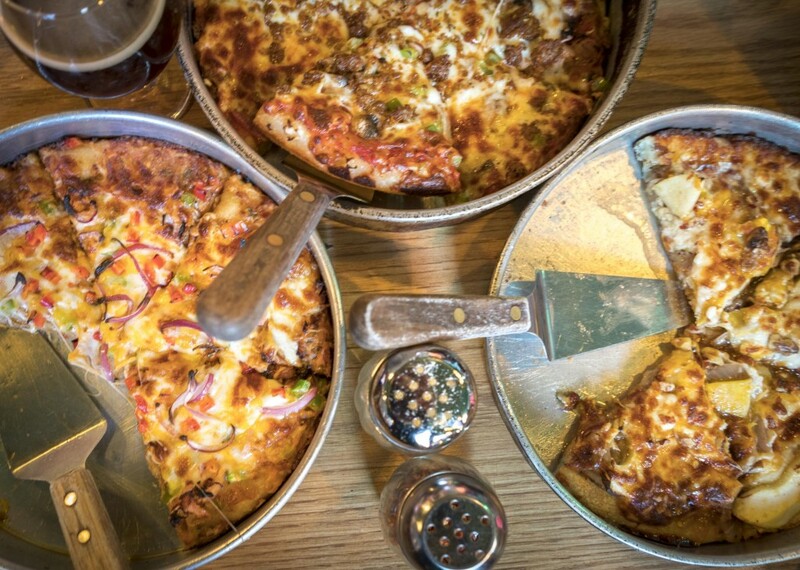 By the time we got that all organized it was time for lunch, so we stopped at Thirsty Pagan Brewing to grab some delicious pizza and fill our growlers with some of their beer. “Yes, we want both sours you have on tap! Oh, sure, we would like to try the Rueben Rolls too, why not?” Yumm is all I can say. 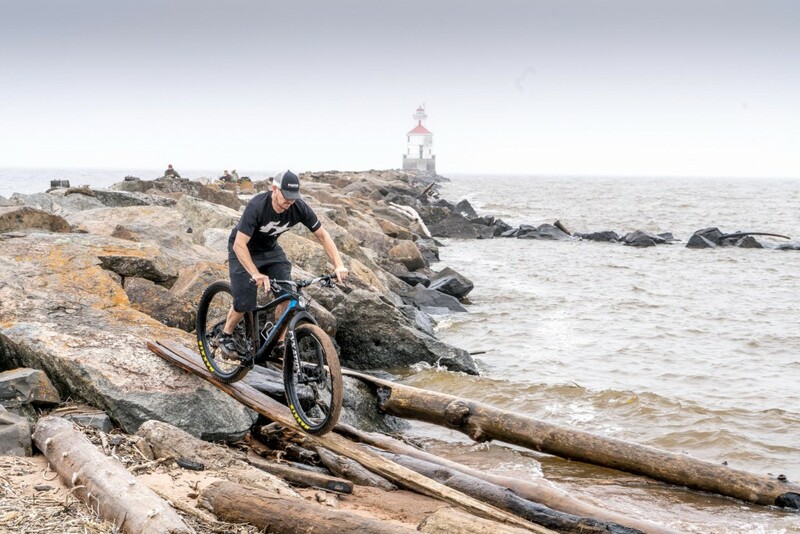 Please stop there if you are in Superior, and when you do say hey to the owner Steve Knauss, a funny guy, strong mountain biker, and big supporter of COGGs. Nick Ginster, one of the owners of Fyxation, dropping in on his carbon Blackhawk shoed with 29+ sneakers. The Blackhawk accepts up to 5 inch tires and you can get it with a second wheelset for an additional $400. Shot with Sony A7rII. I was loving the camera, until I noticed that if I shot few frames in burst mode of the leading rider coming towards me, then paused to wait for the next rider to come into position, the camera stopped buffering and began to write to the card. While it was writing I could not take photos. Even though the buffer had plenty of room, the camera didn’t wait to write to the card. The delay was annoying and caused me to miss some shots, which was not a big deal on this shoot. I could just ask the guys to ride past again if I wanted to, but if I was covering the final laps of a crit with limited opportunities to catch a couple important riders in position within a fast moving peloton, I would be seriously bummed. 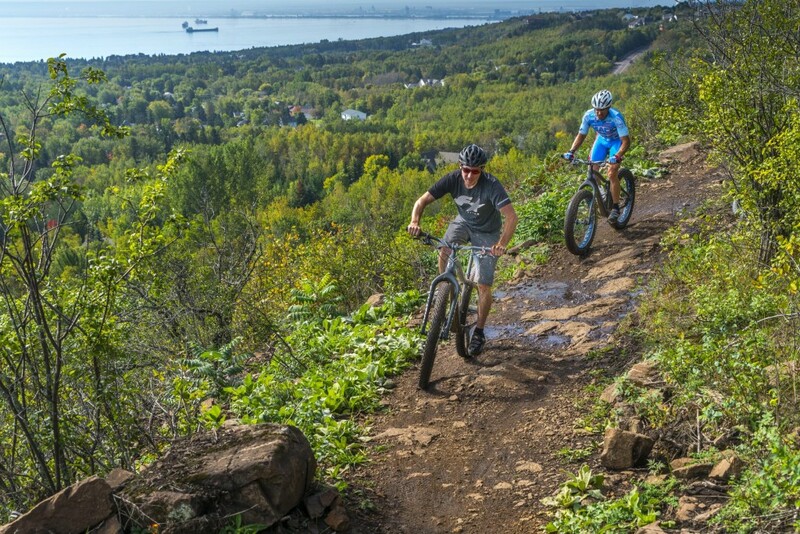 After we rode the Hawk Ridge and promised each other we would come back to ride the rest of the COGGS trails when Duluth dried out a little we packed up and headed to Bayfield. It was nice to see the sun, but by the time we checked in to our condo at the Bayflield Inn, there really wasn’t time to kit up and ride, so we decided to try some fishing. Nick “all things carbon” Ginster brought the rods and tackle, and Julian and him set out to slay some Lake Trout offshore where the mouth of the Sioux River enters Lake Superior, just south of Bayfield. The lake is super shallow here so you can wade in and go a hundred of yards off shore if you want. 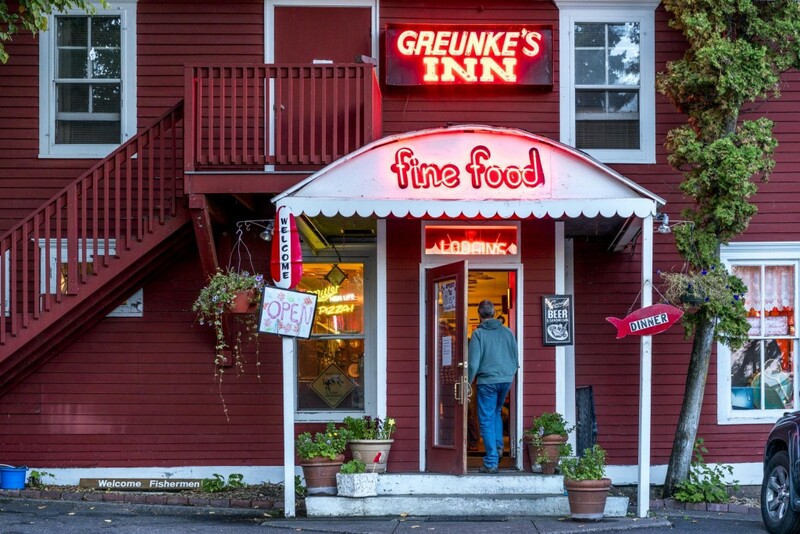 John walking in to Gruenke’s. Photo shot with Sony A7rII. Nick laying it out at speed on one of the many bermed out downhill corners at Mt. Ashwabay. Note, I would not be able to make this photo with my Fuji X-T1, but the all the Sony Alpha cameras allow rear/second curtain sync with off-camera strobes. Photo with Sony A7rII. “So how did we end up here?” Maybe we just need to ride with gps all the time! Photo with Sony A7rII. 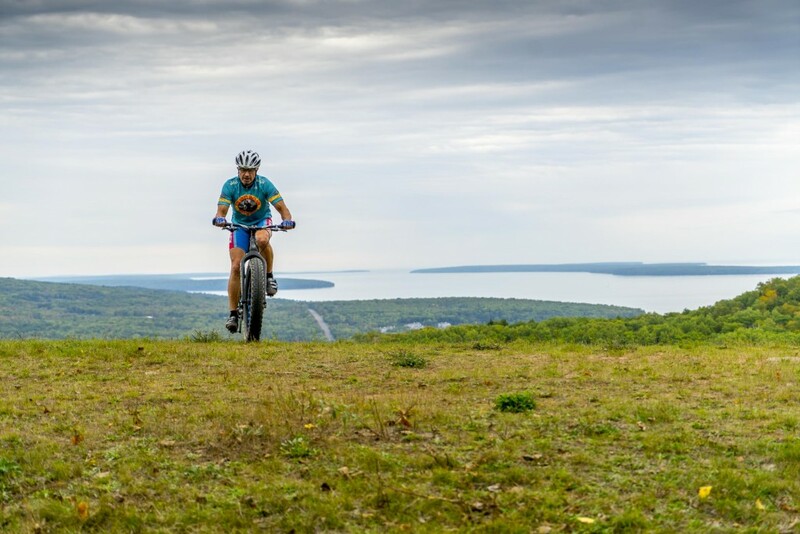 Fleck on top of Mt Ashwabay with Bayfield, Madeline Island and Lake Superior in the background. Forget the idea that fat bikes are slow, the feather-weight carbon Fyxation Blackhawk climbs like a dream. Photo with Sony A7rII. I met Casey racing bikes and when he found out my mom was from nearby Park Falls we began hunting together. I love spending time up at our little trailer in the big woods, both to get away from it all (we don’t have running water, electricity or cell service), and to hopefully add some meat to our family freezer. It is also fun to run into people in town and find out if they know my relatives up there. You never know when you will meet another cousin in a tiny Northwoods tavern. It was before the rut and the deer had so much forage in the woods they were not moving around much, so we only hunted a little and spent more time preparing for the coming winter. 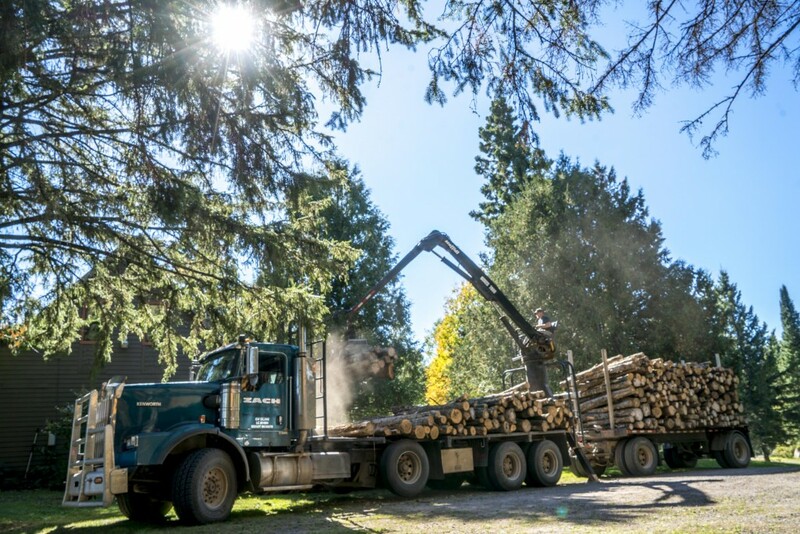 We heat our trailer with a wood stove and Casey’s dad heats his entire home with a larger wood furnace in his basement, so cutting wood is not a small job. 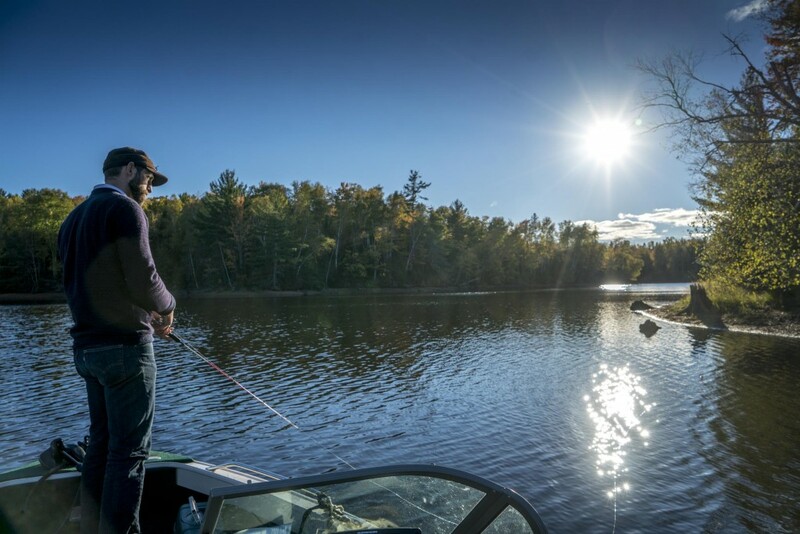 After the wood was finally stacked, we headed out to the Flambeau Flowage to fish a little on Casey’s boat. Once again, it was absolutely gorgeous out on that huge body of water, but we were skunked. Casey said he has never been skunked before and blamed it on the East Wind. I wasn’t complaining, as a day on the water, in the woods, or on a bike is always a better view than from my cubicle back at the office. So will I jump on the Sony Alpha train and sell all my Nikon and Fuji gear? I wish I could, but I just can’t live with the delay when the camera writes to the card after shooting in burst mode. If this is just a firmware issue and Sony can fix it, I would have no trouble putting all my other gear up on eBay tonight. Perhaps if I get my hands on a Sony A7sII when it comes out later this month I can make the leap, but for now, I’m sticking with Nikon, which I have been happy with since 1980. I really want to say thanks to Nick and Ben from Fyxation for donating the sweet Blackhawk and to John Fleckenstein for winning it at the Saris Gala live auction. Everyone at the Wisconsin Bike Fed appreciates your support! Thanks also to my old pal Pat and Sony for hooking me up with the sweet A7rII, I was sooooo close to switching! I know Sony is on the right track and making fast progress with new models and firmware updates. Don’t say this when my D800 is in the room, but I am pretty sure I see a Sony Alpha system in my future.